.A fused dichroic paper pendant made from two pieces of fusing glass with dichroic paper fused in between the layers. Also known as DICHRO-SLIDE™ it is compatible with all fusing glass COE's. It is made by applying a coating to a special base, like dichroic glass it cannot be fused face to face with another piece of dichroic. Shapes are cut with scissors or with a scrap booking punch or similar type of tool. It cuts easily and is very easy to work with. After soaking in distilled water for about a minute and the backing sheet removed, the shapes are then placed on the glass and then capped with clear. Patterned paper, variety packs and frit are also available. The above pendant was made from a colored base with a clear cap over the cut pieces. The colored base is 11/2 inches long by 11/4inches wide. The clear cap is about an 1/8 of an inch larger overall. The shapes have been cut with a scrap booking punch. The fusing glass must be completely clean. The shapes ar soaked in distilled water for about a minute and then the backing sheet is removed. The shapes are carefully placed on the base and blotted to remove excess water and bubbles or wrinkles. Handle the shapes very carefully to ensure they don't become creased or tear, tweezers are a good idea for very small pieces. 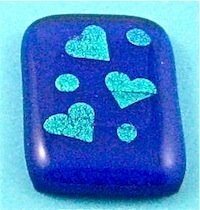 When dry the cap is placed over the shapes and the item is then placed on a prepared kiln shelf and put into a glass fusing kiln. The kiln is kept vented until the binders have burnt away and the kiln is then closed. As this is a small pendant it is brought up to fusing temperature very quickly. Once fusing is complete the kiln is turned off and the pendant is allowed to cool to room temperature. Once cooled, a pendant bail can be attached to the rear of the item. Using dichro paper in this way enables you to produce jewelry pieces very easily and simply.